The PurrSuit Interchangeable Interactive cat toy for fantastic fun play time with your furkid comes with 1 Spinning feather prey clipon. Now Improved with Safer Plastic Clip near your furkid to attach the prey toys to and grip handle for the Cat Slave. 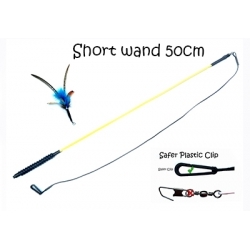 This is the 50cm (19 inch) Short single one part rod. If you have not seen the PurrSuitWand Toy in action with your cat then you are in for a surprise! - the feather attachment spins through the air simulating a flying bird and for your cat look and sound like the real thing! Handmade in the UK with Top Quality materials. A single flexible rod, 50cm ave in length, made from fibreglass and covered in various coloured rubber sheath to stop all possibility of fibreglass splinters. A 50cm black strong cord and comes with one feather spinning prey toy. The feather attachments are made with two pheasant flight feathers which spin in flight, two natural pheasant flank feathers and a coloured Turkey marabou feather. The feathers firmly secured to prevent them falling out. Connects to the rod via ring easily. The feather prey end is interchangeable. There are currently over 70 other different prey attachments that simply clip on to the rod. (Available separately) to provide a large variety of play and long term interest! Also all of the Da Bird and Frenzy attachments can be clipped on using the free ring adapters that come with each PurrSuit rod. PLAY THERAPY -The PurrSuit is an excellent toy to use with behaviour issues. With the PurrSuit Cat toy, fly the feather end around the room or garden in random sweeping movements like a bird in real flight. Your cat's attention will be completely focused on it's "prey". Talk to the cat with a light happy voice. During the flight, land or swoop the feather end close to your cat, they will be waiting/jumping for the right moment to catch their prey! When caught, play dead and take the chance to get away when the cat releases their grip! Repeating this routine will entertain and exhaust your cat. If they are panting, rest for a while and start again until the cat is completely tired. Some single feathers can be used to satisfy the cats catch instinct and for the kill chew instinct. Then a high protein snack. This completes the natural cycle of hunt-catch-kill-eat. It's always best to put away the wand after play sessions. Please store at full length (uncolied) away from heat and your cat. As the PurrSuit toy is so adored with cats of all ages, it is recommended to keep the toy securely locked away, your cat will seek it out and destroy it otherwise! Fibreglass Splinters - The wand is completely covered in a red rubber sheath to stop hurtful splinters in your hand. Safer Plastic Clip - Other manufacturers use a metal clip with a metal pin at the end of the cord to attach the prey toys. The PurrSuit has a strong plastic clip with no sharp pin for safer play near the cat. Made in the UK. Individually crafted by hand with quality materials. Grip Handle - More comfortable to hold with a grip handle. Cord Wrapping - The cord is attached by an extra eye at the top of the wand so less likely for the cord to wrap around the wand. You can also replace the cord easily. Damaged Cord - If your furkid chews through the cord, replacement cord pack are available separtately instead of buying a complete new toy. Wand Falling Apart - Wands are a one part length construction.